Lighters are not allowed anymore, Feedback from Erc P. on the 14th Sept 2018. Outside near the parking / pick-up area. Outside at either end by passenger drop-off. Update from T.Dimas on the 1st Feb 2019: There is a free smoking area near departure gate 5. The smoking area across Hard Rock Cafe does not belong to Hard Rock but TRS Diner and yes you have to buy something there to gain access to the smoking area. Feedback from Erc P. on the 14th Sept 2018. Smoking area in cafeteria behind Hard Rock Cafe. For customers only. You may purchase a bottle of water and smoke there. Feedback from Natalia on the 31st July 2018. 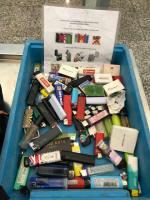 Lighters are not allowed. Image from Eric P.